It must have been fun to work at Warner/Reprise in 1969. There were so many great groups on their roster: Joni Mitchell, Van Dyke Parks, Jimi Hendrix, Frank Zappa, the Kinks, the Grateful Dead… They were the cool label. Selling those records to all the hip kids must have been a piece of cake. 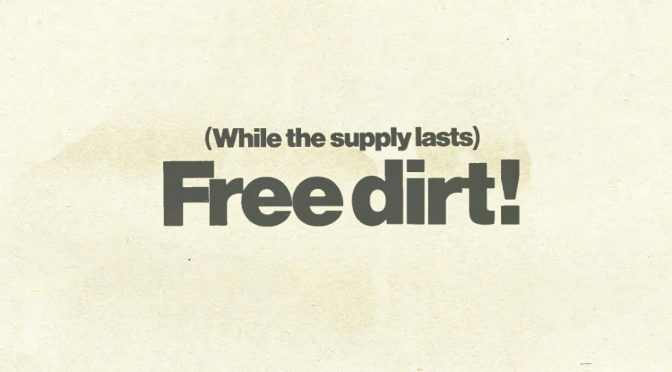 Because when it came time to come up with a campaign to promote Neil Young’s first album with his new band Crazy Horse, Everybody Knows This Is Nowhere, they ended up with a novel idea: free dirt. That’s not a euphemism for anything. You could send in a form and they’d mail you a baggie of dirt from Topanga Canyon. No self-addressed stamped envelope or anything! A little googling tells me this copy was written by Stan Cornyn, who worked for Warner Bros. Records from 1958 to 1991 and is credited for elevating album liner notes to something actually worth reading. He died in 2015. This full page ad appeared on page 9 of the August 9, 1969 issue of Rolling Stone magazine. I wonder how many people sent in for it. 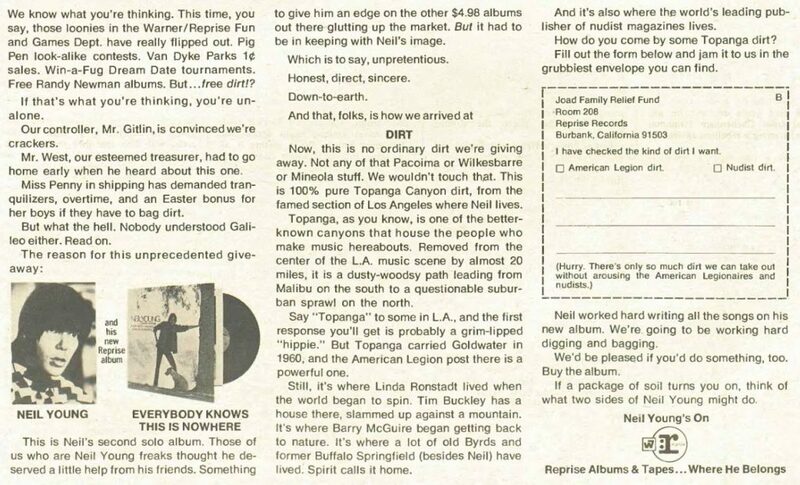 How many people who saw the ad bought Neil’s album? Do any of the bags of dirt survive? Do they turn up on ebay ever? Stan Cornyn wrote a book about his time at WB Records that’s a fun read. He once described the then-new logo for Warner Communications as “two-and-a-half turds in a punch bowl”. He pissed off Joni Mitchell with the ad he wrote for her. He also wrote the liner notes for Sinatra albums too, if I recall. What a character.